Toluene is used in the manufacture of benzene, p-xylene for polyethylene terephthalate (PET) resins, and toluene diisocyanates (TDI) for polyurethane applications, and is widely used as a solvent. The majority of toluene production is unrecovered (i.e., not isolated from other aromatic constituents) and is consumed as a constituent of various refinery streams, primarily in gasoline. Additional quantities of isolated toluene are blended into unleaded gasoline for octane enhancement. This report focuses on toluene that is recovered for subsequent processing in chemical operations. Although Western Europe, North America, South America, and Japan may experience small or no capacity increases (or even declines) over the forecast period, overall world capacity will increase during 2017–22. Capacity growth is driven by expansions in Northeast Asia (primarily in China), Southeast Asia, and the Middle East. About 47% of all toluene was consumed to make on-purpose benzene, mixed xylenes, and p-xylene in 2017. In the last five years, this market has increased by about 1.5% per year. Because of adjustments in operating rates for hydrodealkylation/toluene disproportionation (HDA/TDP) units, toluene consumption can fluctuate between 60% and 70% of total chemical/solvent demand. Strong demand for benzene and p-xylene derivatives between 2004 and 2007 led to increased operation of HDA/TDP units before the economic downturn in 2008. A surge of new p-xylene capacity in Asia, India, and the Middle East also put pressure on toluene disproportionation units, so toluene demand from TDP and selective toluene disproportionation (STDP) has declined, while consumption in transalkylation units has increased. In addition, the direct conversion of toluene to benzene from HDA units has declined in the past five years. Over the next five years, good demand from the polyester sector will result in higher volumes of toluene being converted into mixed xylenes and p-xylene. Direct conversion of toluene into benzene via the hydrodealkylation process will continue to decline. Consumption of toluene by processes that produce a mixture of benzene/xylenes is anticipated to increase 3.5% per year on average for the next five years, following the start-up of facilities in the Middle East, India, Northeast Asia, and Southeast Asia. TDI production is the largest single-derivative market for toluene, accounting for 5% of world consumption in 2017. Stronger demand for polyurethanes has resulted in growing demand for toluene from TDI. Continued investments in developing countries and anticipated recovery in global markets will result in an average annual growth rate for TDI production of 3.4%, with double-digit growth anticipated in the Middle East and India. In 2017, about 28% of the total consumption of toluene was for blending into gasoline. There is an inherent value for toluene’s use in the gasoline pool, both to build octane and to reduce vapor pressure. Nonetheless, demand for toluene blending into the gasoline pool is a function of supply, as the reformers need to operate at reasonable rates. In the past five years, toluene consumption by the solvent market grew at about 1.2% per year. In the next five years, this market is expected to grow by about 0.7% per year. Since 2012, world toluene consumption has grown at about 3.7% per year. However, looking only at chemical and solvent applications (excluding gasoline blending), the growth rate was only 1.6% per year. 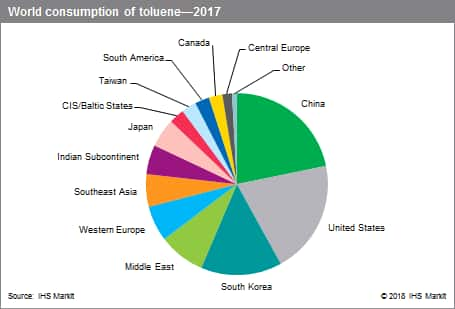 In the next five years, consumption in three regions—Northeast Asia (mostly China), the Middle East, and Southeast Asia—will account for more than 99% of the toluene volume growth, as demand for toluene increases at about 2% per year.